As you are probably aware if you are reading this Twitter are closing down the TweetDesk desktop application, however fear not. 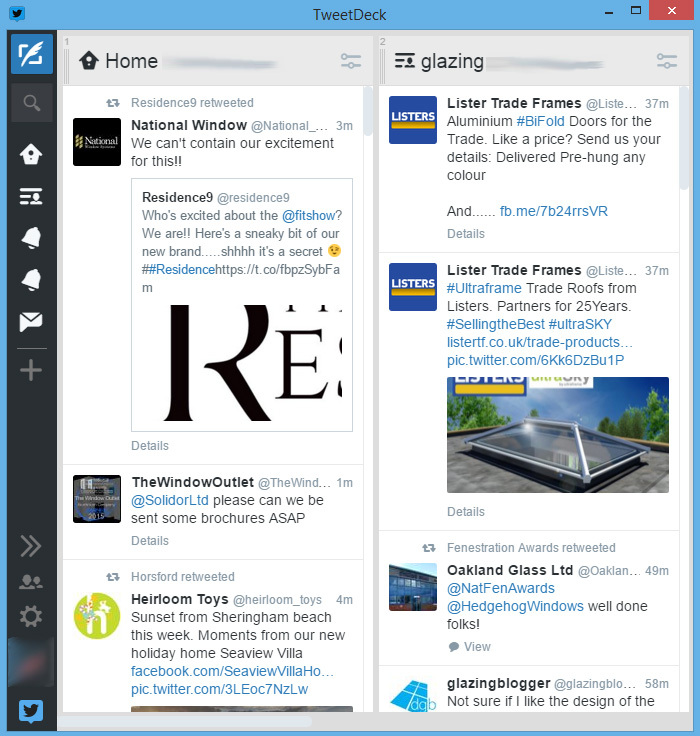 TweetDeck Web looks exactly the same as the desktop application and you can essentially emulate how the old TweetDeck app worked using Google Chrome and a bit of trickery. Essentially you can create a shortcut that will run TweetDeck website in a borderless web browser window, complete with its own icon. As you can see below from the screenshot comparison below running TweetDeck in a borderless web browser window looks exactly like the TweetDeck desktop app. Before getting started its worth mentioning this could used to do this directly in Chrome, however i no longer see the option in any of my current Chrome installs. 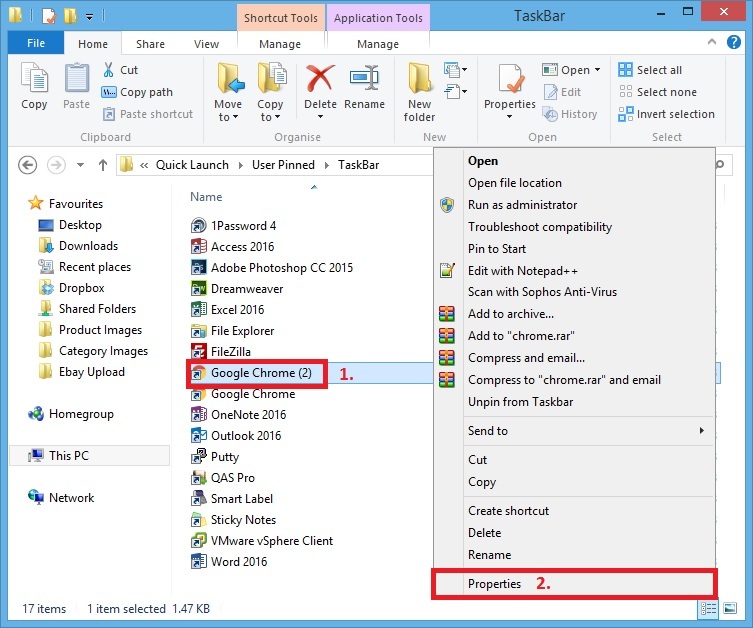 The option used to be under Tools > Create application shortcuts, from here here you could add a frameless webpage to the desktop, startm menu or pinned to the taskbar. Once you have Google Chrome installed go to C:\ProgramData\Microsoft\Windows\Start Menu\Programs and find the Google Chrome shortcut, you want to make a copy of this and rename it to something like TweetDeck. 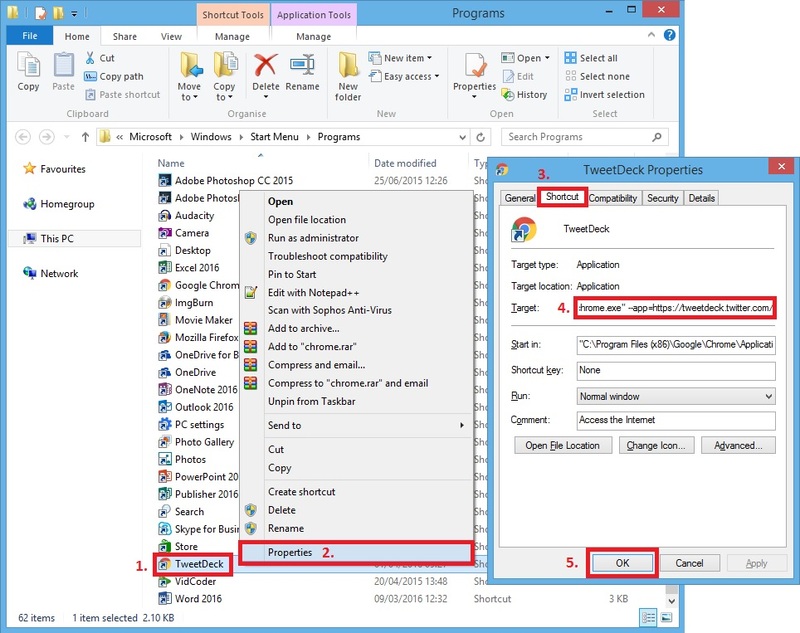 Please note your Google Chrome could well be installed in a different location to the above, if you have the 64bit version installed for example, however all you need to do is add a space then –app=https://tweetdeck.twitter.com/ to the end of the target in the shortcut properties. 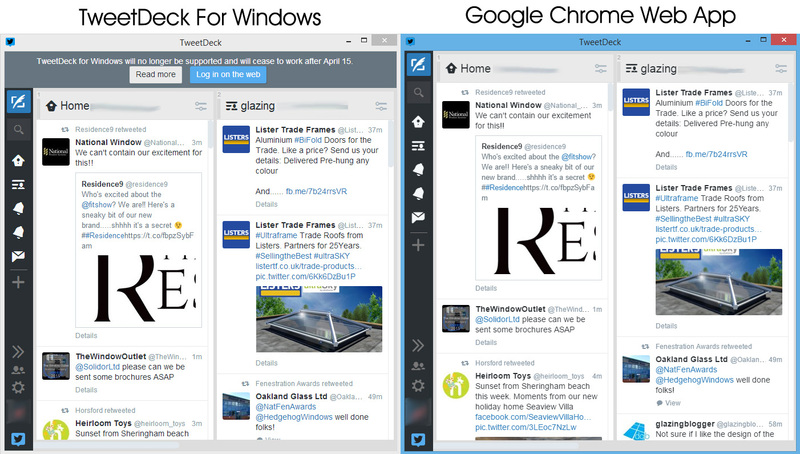 If you now double click on your TweetDeck shortcut the TweetDeck website should load in Google Chrome, however will have no frame around the website, essentially looking the exact same as TweetDeck for Windows did. You can re-size the window however you desire, or even maximize it, without it interfering with your normal Chrome browser session. If you want to pin your new TweetDeck web app to the taskbar you sort of have to go through the above process again, however in a slightly different way. You will then end up with another Google Chrome icon which opens Google Chrome and not TweetDeck. To fix this open the following folder: C:\Users\Matt\AppData\Roaming\Microsoft\Internet Explorer\Quick Launch\User Pinned\TaskBar – be sure to change Matt in the file path to the username you use to log on to Windows with. 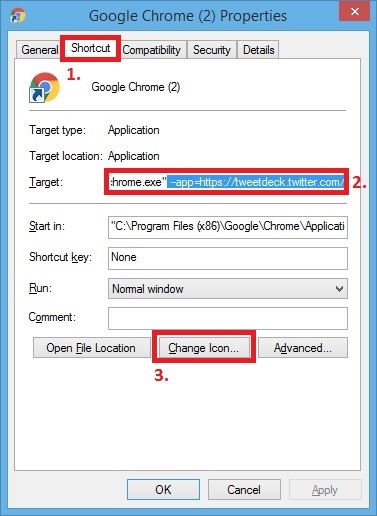 If you also click change icon you can then change the default Google Chrome icon to a Twitter icon, you can Download the TweetDeck Icon here and unzip it somewhere on your system, e.g. 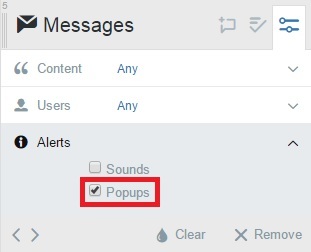 the Documents folder, then simply click “change icon” and browse to the location of the TweetDeck icon you saved, selecting this as the new icon. You can then press ok and rename “Google Chrome (2)” to TweetDeck if you wish. Note: Be aware if you rename the Google Chrome (2) shortcut you will need to log off and log back on again for the changes we just made to be reflected in the Task Bar. You can do it within chrome by clicking on the options button, then more tools, then add to desktop. Make sure you click the checkbox in the following window to “open in a window” something like that. 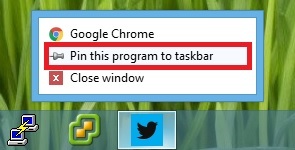 It will place a ready-made shortcut on your desktop which you can then pin to the taskbar. You could used to do that, i no longer see that on my current Chrome installs as i mentioned in the blog sadly. Can you actually see that option? I’m not sure what you have done differently to me, however I have managed to do this for TweetDeck, WhatsApp Web and Facebook Messenger. It was a bit tricky but I didn’t do anything more than what I documented in the blog post. Maybe you could look in to doing it with Firefox, I think that can do something similar. That way it;s independent from your main web browser. I figure it out. I have your exact same problem, after an hour searching and trying found the problem. I’d copied and pasted “–app=https://tweetdeck.twitter.com/” from the instructions, if you do the same, just erase de “-” at start and put it again. For some reason the “-” is different and that’s why it didn’t work.